If you’re an old-school game lover like me, you’ll be happy to know that computer whiz and retro game aficionado Martin Kool is in the process of bringing several of your Sierra favorites to the iPad. Gameplay on the iPad will be completely touch-compatible and driven by a series of action buttons, so there will be no need to type for those who hate doing so on the touch surface. Users will be able to navigate to a specific URL once the iPad versions are released and will be able to add buttons to their home screen, no jailbreaking needed. What’s surprising is that sarien.net is simply a hobby, based solely on Kool’s passion for the games. He is not affiliated with Activision and therefore may be, at some point, asked to take down the site. When asked how he’d respond to a cease and desist from Activision, Kool told TouchArcade that he would absolutely comply, but that he’s hoping they’ll grant him a noncommercial license and allow Sarien to stay up. I, for one, am hoping they’ll appreciate the free publicity and let the rest of us reap the benefits. You can play the games on the website to wet your palette, but here is a video teaser to give you a sense of how iPad gameplay will look. Whoa, imagine Leisure Suit Larry on the iPad…. This is such a fantastic story, thanks for writing it up Jen! I have loved those games as long as I can remember, which is longer than I care to think about. Hopefully Activision will take the non-commercial license route rather than the C&D route. Dude, this totally makes my morning — thanks for sharing this news. 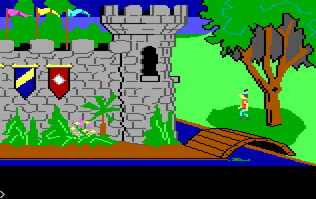 There are still days when I can close my eyes and remember every detail of Space Quest, Police Quest, and all the early King’s Quests (especially on my PC Jr.).